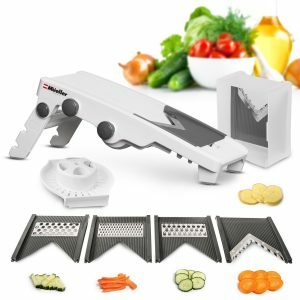 A Complete Guide To Help You Find The Best Mandoline Slicer! 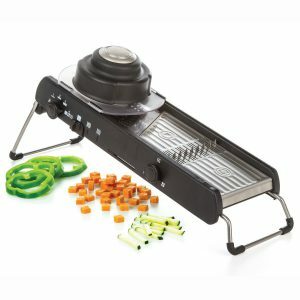 Home General A Complete Guide To Help You Find The Best Mandoline Slicer! Umm what is a mandoline? It sounds like some sort of a musical instrument. A mandoline is a cooking utensil used to uniformly slice fruits and vegetables. If you guessed it was an instrument, you wouldn’t be entirely wrong. Mandolin (spelt without the e) is actually a small stringed instrument LOL. Most mandolines also have the capability of doing Julienne (AKA French Cut) cuts. If you’ve ever eaten a Vietnamese sub, you’d notice the carrots were cut in a matchstick shape…..that’s basically a Julienne. If you don’t have one already, here’s 4 reasons why you need to! #1 Much Quicker Than Knives! Mandolines can slice up a potato or cucumber in less than a minute. Use your chef knife and it would take at least 3-4 minutes to get perfectly uniform slices, and to achieve even this you’d need an incredibly high performing, hair-splitting sharp knife. Good luck with that! Jennifer Cornbleet shows us how it’s done below! #2 For What They Do, They’re Pretty Cheap! A quality mandoline will cost you a fraction of a chef knife. You’re looking at anywhere from roughly $30-80 and possibly even cheaper. Not a bad deal considering this device will literally save you tons of time in the kitchen! If you already own one, you’ll know exactly what i’m talking about! Mandolines allow you to get creative and adventurous with your salads. Pick your ingredients and start experimenting. It’s really as simple as that. What makes this different from your traditional salad? Thinly sliced fruits and vegetables take it to the next level. Don’t believe me? Check out Melissa Clark’s invention below! By far my favorite thing about the mandoline is its ability to thinly slice chips. And by the way, i’m not just talking potato chips here……cassava, yam, and pretty much anything you can think of. I loooove cassava chips, so last week I prepared myself a nice big batch. Truth be told, they taste a gazillion times better than the $6 pack you get at the grocery store. 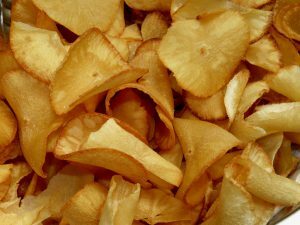 Ever Tried Cassava Chips? Delish!!!! 9 Things To Consider Before Buying! We’ve talked about why you need to get a mandoline, but how do you know which one to get? This is where you need to determine what’s important to you, and filter out everything else. Below are some of the things I would consider before buying. #1 How Safe Is It To Operate? First on my list is safety, simply because it’s the most important consideration in my opinion. If you watched the videos above, you’d have noticed one similarity: both users were wearing cut resistant gloves while operating the mandoline. Ideally you will want to select a device that comes with a food safety holder, so you minimize your chances of getting cut. Remember, the best mandoline slicer is the one that’s safest. Having said that, the first thing you should always be checking for are the safety features. Does it come with a hand guard? How comfortable is it to grip? Do you need cut resistant gloves? Hand Guards Reduce The Likelihood Of Getting Cut! #2 How Easy Is It to Clean & Maintain? Cleaning and maintenance is another very important consideration. Mandoline slicers come in all shapes, sizes, and materials. You’ll want to pick something that can be disassembled and cleaned easily. Even if recommended, never put your mandoline in the dishwasher. If you do, you risk destroying the assembly as well as the blade edge. Stop being lazy, and wash by hand! Generally, the larger the mandoline the longer it will take to wash and dry (the larger ones are also more difficult to store). On the flip side, large mandolines are easier to grip and therefore use. What we have here is a trade-off. My recommendation: look for something in between i.e. not too large, not too small. #4 Can The Blade Be Removed? This is important because after multiple uses the blade will eventually dull, and when this happens you need to be able to either replace or resharpen. How safe and easy is it to remove/replace blades? Is it easily accessible? Everything with a cutting edge will eventually dull! In addition to this, you’ll want to verify if the blades can be interchanged. Mandolines that come with interchangeable blades allow the flexibility of performing various cuts (wide, chunky, narrow, extra narrow etc.). When deciding, you’ll need to understand what style of cuts are most important to you. 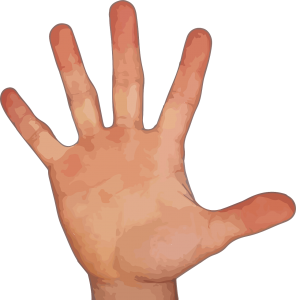 #5 Have You Thought About Cut Resistant Gloves? Truth: there will be times when you cannot use the safety holder/hand guard. In these instances, it just is a whole lot easier and natural to use your hands. The cassava chips above are a great example. Because of the awkward shape/size of cassava, I used my hands and omitted the hand guard altogether. While it’s okay to do this, you should remember it’s much easier to cut your fingers! Mandoline slicers and cut resistant gloves go hand in hand. I strongly recommend investing in a pair! Be safe, save yourself the pain and invest in a pair of good cut resistant gloves. Not sure what to get? Don’t sweat it! Here’s an article I previously wrote on cut resistant gloves. Make sure you check it out! How Would You Feel About Losing One Of These? 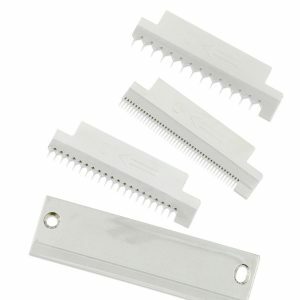 #6 Steel Or Ceramic Blade Inserts? They Don’t Rust/Stain—Unlike steel blades, ceramic blades will not rust or stain even after prolonged use. They Don’t Ghost—Ghosting is when flavor from a vegetable/fruit tends to linger around. This typically happens when a strongly flavored/scented fruit/vegetable is sliced or chopped. Another advantage of ceramic blades is that they don’t ghost, or carry unwanted flavors. They Remain Sharp Till Infinity—Okay, maybe not infinity but a very long time. Because they remain sharp for very long, you don’t have to worry about sharpening. But, they also have disadvantages……the biggest one is that they are brittle and will chip with even the slightest of knocks. Debating which material is better than the other is futile. Both materials have their pros and cons, so it’s up to you to figure out which one will suit your needs best. I will say this however, if you choose ceramic then go with Kyocera! If there’s any company that knows ceramics, it’s them. 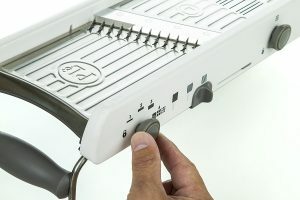 Electric mandoline slicers generally cost more money compared to their non-electric counterparts, but they offer more than just the ability to slice or julienne fruits and vegetables. 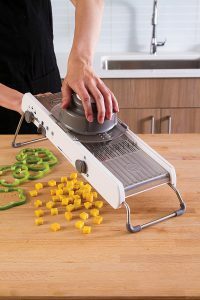 With an electric mandoline, you can typically slice, dice, grate, shred and more. But there has to be a caveat right!? And there is. Electric slicers have a high failure rate! That’s why I personally prefer the reliability that comes with a standard, non-electric mandoline slicer. The question is…..what do you prefer? #8 How Much Are You Willing To Spend? In your quest to find the best mandoline slicer, you will need to set yourself a budget. You’re probably wondering “okay, well how can I set myself a budget if I have no idea how much one of these things cost?” The prices on mandoline slicers vary greatly. You’re looking at a price range from about $15-80 roughly. 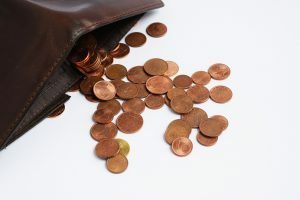 Set yourself a budget and don’t splurge a cent more! Remember, just because it costs more doesn’t mean it’s better! #9 Did You Check Out User Reviews & Watch Product Demonstrations? As a final step, you should always check out reviews and videos of the product before buying. What do other people say they like/dislike about it? Does it look easy to use? 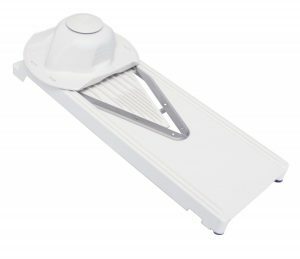 Now that you have an idea of what to consider before buying, i’d like to provide a quick recommendation of my 5 all time favorite mandoline slicers. If you have specific questions about each of the products, please do not hesitate to drop me a comment. I’ll be more than happy to respond to your queries. Also, if you know of or have used a different mandoline than below, please let us all know! What worked (or didn’t work) for you could be very useful to someone else! A huge fan favorite and incredibly popular online, so there’s gotta be something really awesome about this. Keep reading to find out! Swissmar Borner V-1001: A Feat Of German Engineering! It Works & Boy Does It Work Well! Engineered and manufactured in Germany, the V-1001 is a no-nonsense slicer. At first glance I didn’t think too much of it….but my opinion changed completely when I tested it! The first thing I noticed upon trying this slicer was how efficient it was at getting the job done. Slicing up cabbages, onions, potatoes, and cucumbers was a breeze. Overall, the design is solid, blades are razor sharp, and it feels comfortable to use. In case you’re wondering, it comes with a single thick/thin cartridge to slice, and 2 separate thick/thin julienne cartridges. When it comes to kitchen tools, I have a bad habit of putting something away (in a cabinet) and never using it again until thanksgiving or Christmas. Out of sight out of mind indeed! And that’s one of the things I like about this. Everything sits nice and snug in a storage caddy, and can be left right on your kitchen counter! Cleaning’s A Piece Of Cake! Cleaning is pretty straightforward. Rinse under lukewarm water and then towel dry. Try to avoid touching the blade, and you should be fine. 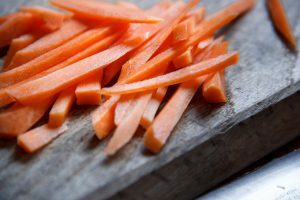 If you’re slicing carrots, you may need to apply some pressure when scrubbing to get rid of the orange colored stains. When you’re done slicing, you’ll be left with a teeny weeny piece of cucumber (or whatever fruit/vegetable). This tiny piece gets stuck to the blade, and I’d find myself reaching in to grab it with my bare hands. I didn’t realize it at the time, but I could have gotten cut pretty easy. Word of advice: use cut resistant gloves ALL THE TIME. Versatile, safe, easy to use, and best of all….affordable! 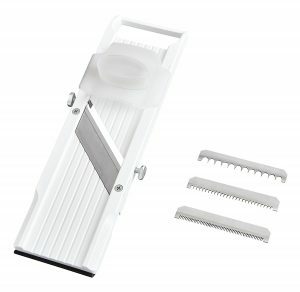 Is this the best mandoline slicer? Mueller V-Pro 5: You’d Be Surprised By How Much This Thing Can Do! For all it can do (see below), it’s very reasonably priced (click here to check latest pricing on amazon). You know how every once in a while you stumble upon a gem when shopping online? This is exactly that. Oh, and did I mention that it comes with a lifetime warranty? It also helps that Mueller are awesome to deal with. There’s So Much It Can Do! Normal Slicing—The standard v-slicer blade is used for normal slicing. Wavy Slicing—Especially useful for making wavy french fries! Fine/Coarse Shredder—Great for shredding carrots or other vegetables. Grater—You can toss your old one out. This works perfectly for cheeses! Julienne Slicing—You can do 6 or 9 mm thick julienne slices. Juicer—Haven’t used this much, but a nice bonus to have. Pretty darn cool huh! You’re probably wondering about thickness. How thin or thick of a slice can I get? 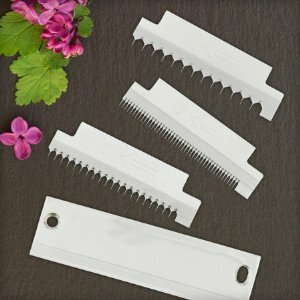 You can adjust the thickness of the v-slicer, wavy slicer, fine/coarse shredder, and grater to anywhere from 1-9 mm. You do this by rotating an adjustable knob placed near the stand. Because the stand folds in/out, you can have greater flexibility to do your slicing/shredding over a bowl. I can’t tell you how much this would come in handy. For example, grating cheese right over my plate of pasta! Keeping your blades safely stored will ensure they last a lifetime. Having said that, the blade storage container works really well. Everything fits nice and snug, and the container keeps moisture out. What I Dislike – Nothing! If you’ve been following my posts, you’ll know there’s very few times when I can’t find anything negative to say about a product. This is one of those rare instances. Quite different from the others, this Kyocera slicer embodies the KISS principle. Keep it simple, stupid! 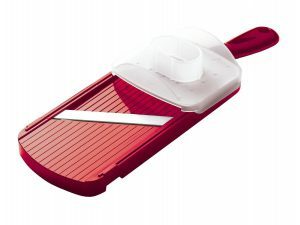 Kyocera Mandoline Slicer: No Bells, No Whistles….Just A Slicer! No Rust, No Stains, No Ghosting! As mentioned earlier in the post, ceramic blades will not rust or stain. Also since it’s a non-reactive material, it will not carry flavor/smell from pungent vegetables. As far as long term maintenance is concerned, I prefer ceramics over traditional steel blades. An interesting thing about ceramic blades: they look harmless! It’s only until you handle one, do you realize how dangerously sharp they are. Looks can be deceiving indeed. Because these blades are so sharp, the pressure required to slice a vegetable is minimal. A couple swipes and you’re finished. Don’t believe me? Watch the video below and see how easily he’s able to slice a potato! Compact, So Clean Up Is Simple! I am big fan of compact, portable kitchenware. Not only are they easy to store, but they take a lot less time to clean. I don’t know about you but the less time I spend cleaning, the happier I am! Use this without cut resistant gloves and you’re asking for trouble. The ceramic blade is sharp enough to cause some serious damage. The hand guard isn’t particularly great, so in most cases you need to use your hands. 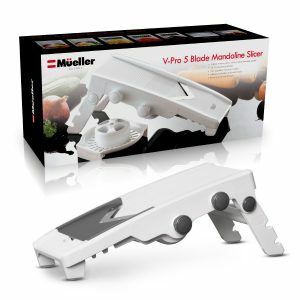 Not sure if it’s the best mandoline slicer, but more than certain it’s the safest you’ll find! Secure Hand Guard Makes It Incredibly Safe! How important is safety to you? For me, it’s one of the first things I look for in a mandoline slicer. If a device is unsafe to operate (even with gloves), it’s something i’m less likely to consider. Out of all 5 slicers, this is the safest. This is primarily due to the well designed hand guard. It stays secured in place and only slides in one direction back and forth. Risk of injury is eliminated! This would be the first mandoline I’ve ever seen that can do cubes. Kinda a big deal for me because I make lots of vegetable soups, and cubed vegetables are a must. Cube shaped fruits and vegetables are also awesome for salads! Because the thickness and blade type can all be adjusted by knobs, you further eliminate the risk of injury by not having to change out blades manually. The caveat: blades cannot be removed or resharpened (more below). Essentially you sacrifice one thing for the other (blade replacement for safety in this case). There’s a trade off as mentioned above. You get a safer device but you sacrifice blade replacement and resharpening. What’s more important? That’s something you’ll need to decide! Last but not least is the Benriner, which is similar in many ways to the previously discussed Kyocera, but definitely more versatile! Benriner Mandoline Slicer: A Versatile Slicer That’s Perfect For All You Minimalists! When it comes to food prep, i’m about as lazy as they get. If there’s a tool that makes my life easier, i’m all in! I love the fact that this can securely hook on to bowls, as it means I can do all my slicing right on the fly. If you like salads or soups, you can definitely relate! Blades Can Be Removed/Accessed Easily! As far as blade accessibility and resharpening is concerned, this slicer trumps all the rest. And that’s because what you’re holding is an actual blade, and not a blade attached to a cartridge of some kind. Resharpening is easy because you have unrestricted access to the cutting edge. Side note: manufacturer doesn’t recommend resharpening the blades. I know what i’d do! Another slicer you should not use without gloves. When you factor in the cost of buying a decent pair of gloves with this unit, it gets a little pricey (click here to check out latest pricing on amazon). If you made it right till the end, congratulations you’re now an expert. I’ve attempted to cover as much information I can but if there’s something you feel I missed, please leave me a comment and let me know. Do you agree with the 5 recommendations I have above? If not, please share with us your best mandoline slicer! Hope you enjoyed reading.